Portable Video, Audio and Lighting Controller. 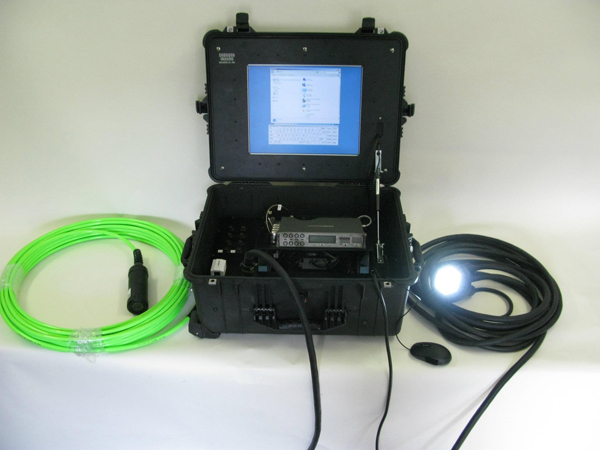 SAIS developed this Ehternet based system for remote monitoring of fish activity by the University of Massachusetts (UMASS) Fish Ecology Department. The system includes an audio recorder, video recorder, Ethernet camera, SAIS Ethernet LED light with power supply for all devices and full dimming control for the LED light. Camera, Light, video recorder and audio recorder. A single case for video and audio recording with built in Network Video Recorder (NVR) capable of recording up to four cameras and streaming direct to the internet. The NVR allows the user to program interval or alarm-triggered recording. It also provides overlay of date, time and custom titling on the recorded video. The 17inch LCD screen is daylight viewable and provides a live view from the camera(s). The power supply and dimmer for the light are integrated into the design. This one includes an audio recorder (Sound Devices 788T - http://www.sounddevices.com/products/788t.htm) and 8 hydrophone connectors (Cetacean Research Technology - http://www.cetaceanresearch.com/) as specified by the end-user. The completed system was shipped December 2011.